Earlier this year, we introduced our new project pages, giving clients and suppliers enhanced shared pages to collaborate and drive project performance. Today, we are introducing Workspaces, offering programme level control through one dedicated Workspace including financial and risk review, toolkit of software used as well as up to date documents. Use Workspaces to connect and control project information across your organisation, increase visibility of risk and enable data-driven decision making. Available today on IAND, to both clients and suppliers. With Workspaces, project teams get a complete overview of projects, spend, performance and risk. In addition, project teams benefit by having one central place to share with stakeholders and supporting real-time project reviews. Project teams can arrange the Workspace to group projects ways that best fit their organisation, such as by major project or department. Providing more control over how you want to organise your project or framework. Gives greater visibility of risk and opportunity, reducing risks when delivering major projects. Improved high level overview of each contract, the supplier project table enables quick scans for areas of risk or underperformance. Disparate tools and systems can make for complicated stakeholder oversight, and control of performance. Workspaces addresses this through one shared access to real-time programme level information. 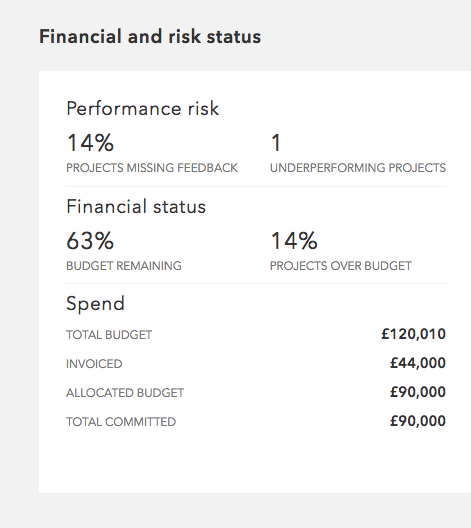 The 'Financial and risk status' module quickly highlights easy to digest financial summary, including key financial factors such as budget remaining. Reducing surprises for senior stakeholders, and a practical oversight for project managers. With more software tools being used to deliver projects, Workspaces provides an easy way to share the tools within your team on a specific programme. Giving the ability to have one space to share the key documents, policies and guidelines that apply to your project. Make the most of Toolkit, by adding links to software and services used by your team to deliver projects. Any member of your team with IAND access can add links to the Toolkit. Simply enter the name, description and link to software used. If you have ideas or suggestions for future features, or would like a full run-through of Workspaces please get in touch and we'd be very happy to visit, call or arrange a webinar.